Have you ever really thought of the backyard you used to play kickball in, or run around with friends in could possibly be the place where you get married? Well, it can be! The backyard wedding has become very popular and is really picking up momentum. It is a wonderful place for family and friends to gather, and with this intimate, private space it really allows everyone to be comfortable and relaxed on such an eventful day. Holding the ceremony and reception in a beautiful yard will also save you a bundle! Saving money on the location allows the couple to splurge on gorgeous flowers for the wedding party and centerpieces, dinner for the reception, and also to book that great band you wanted to play! 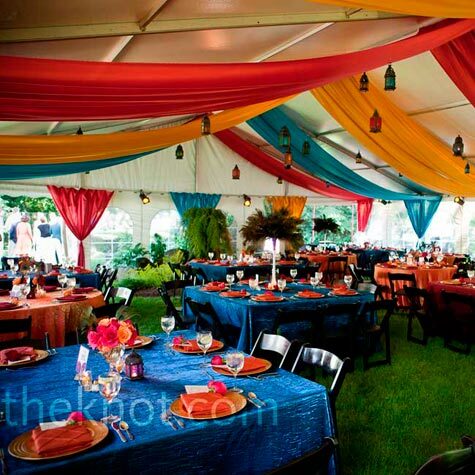 Even though it is your backyard, the reception can still be elegant! Here are a few ways to really change the space and make the most of what is there. 1. Use tents! They are great way to make an open space feel more closed in and allows people to feel like they are in the same "room" as one another. Using these elements it creates a feeling of closeness during the day and into the night. 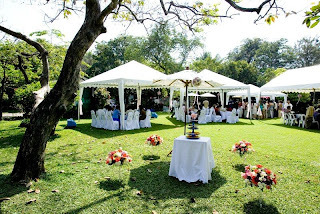 Tents are also a great way to protect your guests from the sunlight if the ceremony and reception are during the afternoon. 2. 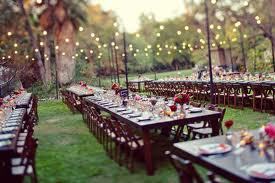 Lighting is also a key aspect to any outdoor/backyard wedding. Having fun and different types of lighting really change the feel of the day when it becomes dark out. Candles, lanterns, or string lights are a great way to make the space feel beautiful and elegant even when the sun goes down. 3. Linens are also a wonderful way to dress up a normally casual space. Bringing in different colors, beading, and textures are great ways to spruce up plain tables! Another idea would be to have a runner go down the center of just a plain white table linen. This way it you could still achieve a traditional look but with a pop of color, or texture to the center. Good luck with your very on Backyard Wedding, we would love to hear some of the things that you did or are planning on doing! A backyard wedding can be a refreshing and very individual way of expressing yourself on your wedding day. It is truly a reflection of the bride and groom and can be very intimate or extravagant affair. When having a backyard wedding there are few things to consider in the planning. Is it just the ceremony, or do you plan to have the reception in the backyard as well? Here are just some ideas and tips to keep in mind for you beautiful alfresco wedding in the backyard.